There are Hamptons homes and then there are Hamptons homes. This $43.5 million Bridgehampton South home is, undeniably, of the latter breed. Take, for example, the sprawling mansion's 10-seat movie theater with "interactive seats." Then there's the home's indoor, two-lane bowling alley, and full bar and disco. If that wasn't enough entertainment for you, there's also an indoor virtual-golf course, skateboard half-pipe and rock-climbing wall. And to help you soothe those tired muscles after a full day of activities: a spa facility with an indoor Jacuzzi, right by the massage area. Or just jump straight into that magnificent, 60-by-20-foot, heated, gunite pool while blasting Beethoven through its underwater speakers. Luxury features aside, we're fans of the home's blend of contemporary and classic decor. 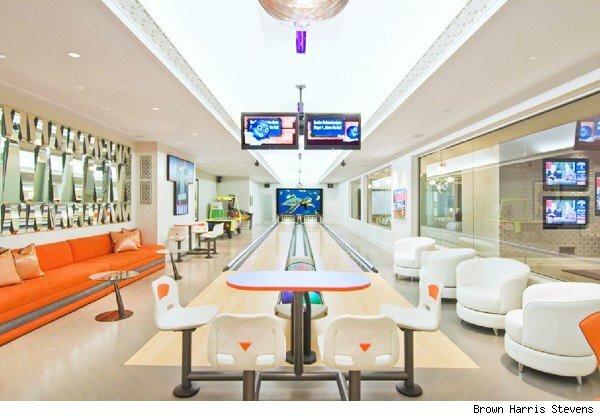 Ranging from dripping crystal chandeliers and elegant claw-foot tubs, to sleek, ultra-modern living spaces decked out in colorful art, this 31,000-plus-square-foot mansion is a winner -- bowling alley or not. Chris Burnside of Brown Harris Stevens has the listing. Click on the images below to see more homes for sale in Bridgehampton, N.Y.